Last month, I attended my second Kinfolk event. As you know, Kinfolk is a beautiful print that also organizes workshops and events all over the world (if you didn’t hear about it, I strongly recommend you to check their website and my first post about the first event I attended). This time the theme was herbal infusions. 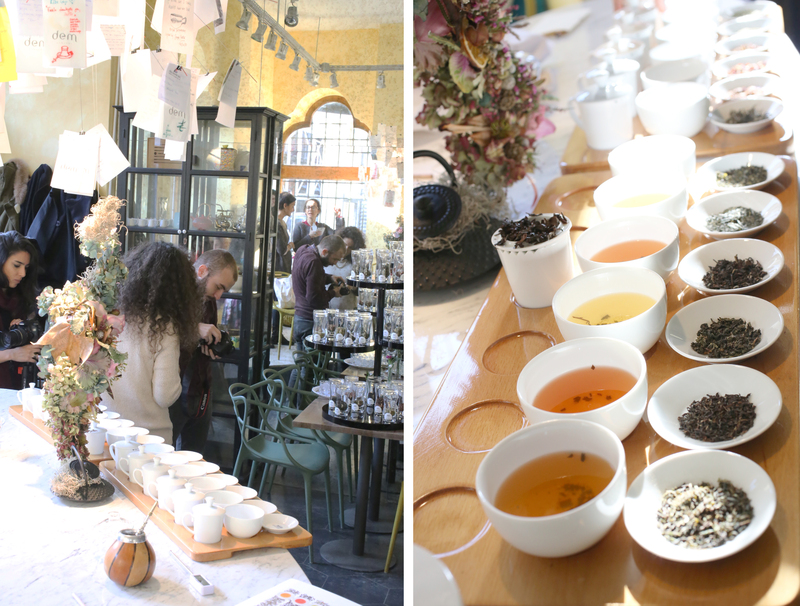 As a herb and tea enthusiast, it was impossible for me to skip on this event! Our host Ece, is an amazing tea expert so the whole workshop was based around her expertise on tea, blends, infusions and the history of tea in general. 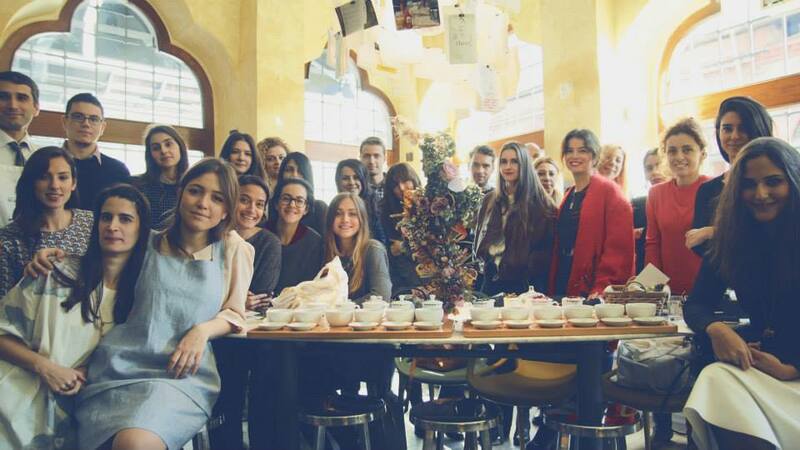 The workshop was held in one of the newly opened tea houses in Istanbul, Dem Karaköy. It is a beautifully designed place, and the menu is unbelievable: they have 60 different teas, and we later learn that Ece did the consultation for that amazing menu. It is so refreshing to see something like this in Istanbul: we mostly have coffee houses but we don’t praise tea enough in cafés and restaurants… I thought my love for tea was quite intense, until I met Ece; She has the most amazing stories to share about tea, and has her own recipes for blends, and she shares this love with her readers in her beautifully constructed website. I was lost in it for hours! It was a beautiful day of professional tea tasting; We had a privilege of tasting more than 10 different teas of the famous Ronnefeldt tea brand, even the different flushes of the same varieties (like Darjeeling first flush/second flush). We learned about varieties of tea, the differences, simmering techniques, tea history and blending. 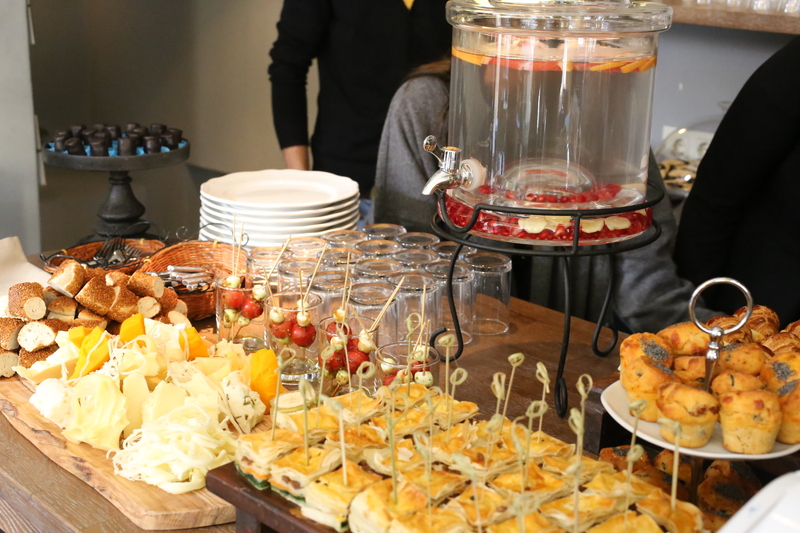 Dem Karaköy has a very cozy atmosphere which went great with the event. I particularly liked how they filled the space with little details -all about tea. Ece’s tea menu for the day was mind blowing; We tested Ronnefeldt’s Nurbong (Darjeeling first flush), Jungpana (Darjeeling second flush), Milky Oolong, Superior Fancy Oolong, Fancy Sencha, Green North Tukvar, Silver Yunnan, Rooibos, Maracuja Orange, Good Vitality, Yerba Mate, Vervain and Jasmine Pearls. It was surprising to learn that we can only call ‘tea’ to the ones coming from ‘Camellia Sinensis’ plant. The other ones called infusions or herbal teas. There are 6 different varieties of tea depending on their oxidation/fermentation levels and processes; white, yellow, green, oolong, black and pu-erh. The quality of soil, weather conditions, sun and rain exposure, cultivation, and processing techniques define the quality of a tea. Ece is holding a special glass cup named ‘Gaiwan’ in the picture above. She told us that this is a three-piece cup and each part represents the nature; the plate is the soil, the cup is the human and the lid is the sky. Very meaningful isn’t it? First we see and smell the tea in dried form. It was enlightening to see how good quality the leaves are. We have learned that the powder form of tea is often seen as very low quality, and therefore less expensive and used in tea bags. So, no more tea bags for me! I always try to source organic teas but I never really thought about the teabags, now I am a firm believer in loose tea, thanks to Ece. Then, she wanted us to smell and see the leaves in wet form, again it was fascinating to see how their form and smell changes right away. We learned that the quality of water is quite important, it should be filtered or spring water and around pH 7. I was also surprised to learn she is using a thermometer to measure the warmth of the water. I found out that I was burning my white tea so far! The steeping temperatures vary; for green tea 70-80 °C, yellow 77-80 °C, white 66-75 °C, oolong 85-90 °C, black tea and pu-erh 96-100 °C. If you user hotter water, the taste will be much bitter, so I’d try to stick to these measurements. You can see different colors of ‘liquor’ (the extracted liquid). 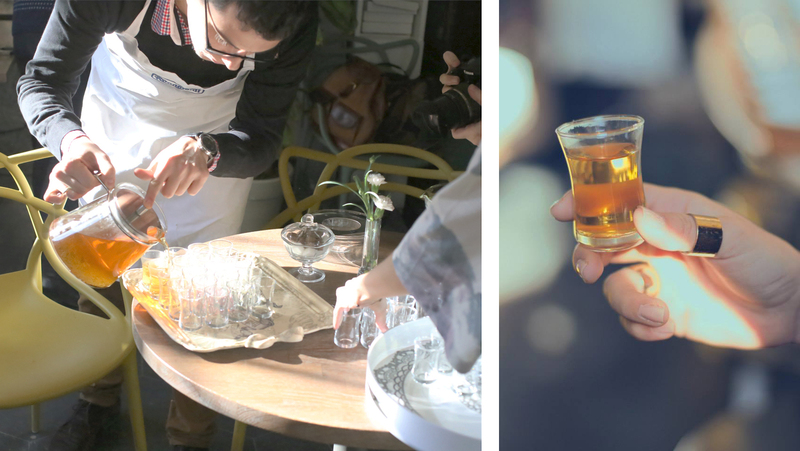 It was an interesting aspect of tea tasting, a true ritual. Each of them has different caffeine levels, of course not as high as coffee, but still. As you may guess, black tea has the highest amount (approx. 135 mg caffeine for a cup) and white tea the lowest (10 mg for a cup). Most herbal teas are caffeine free- except yerba mate. They served us the teas in super cute, tiny tasting tea glasses. This form is classically Turkish. I actually found these glasses couple months ago in a famous Turkish glass shop (Paşabahçe). It was a pleasant surprise to see them here. I also want these teapots! Very practical and I really like their design (which is unusual to me as I am very picky when it comes to choose a good design). My favorite tea was Milky Oolong, Ece told us that this is her favorite one as well, and she is drinking it everyday. When she was describing it, I couldn’t believe that it has this milky flavor. However, it really surprised me. The funny thing is, I don’t drink milk and don’t like the taste of it, but it tastes incredibly soft. I need it in my life! She also made us taste some fruity blends, such as this one, Maracuja Orange. 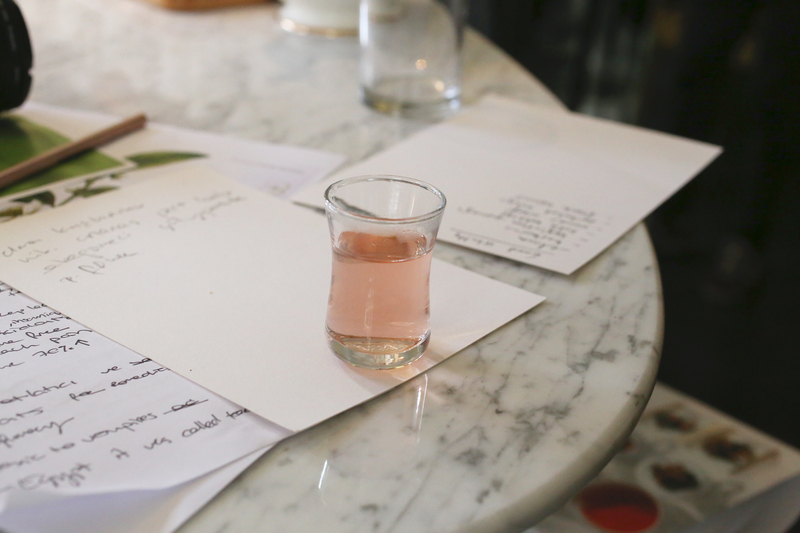 It was one of my favorite, and I adored the liquor color -never seen a tea that is very light pink before. This one also makes great ice tea according to Ece. The food buffet by The Food Project. It was delicious as usual, I really enjoyed the gifts they prepared for us; Jasmine Cookies and Lollipops. I wish I had more -they inspired me to do my own raw jasmine cookies! 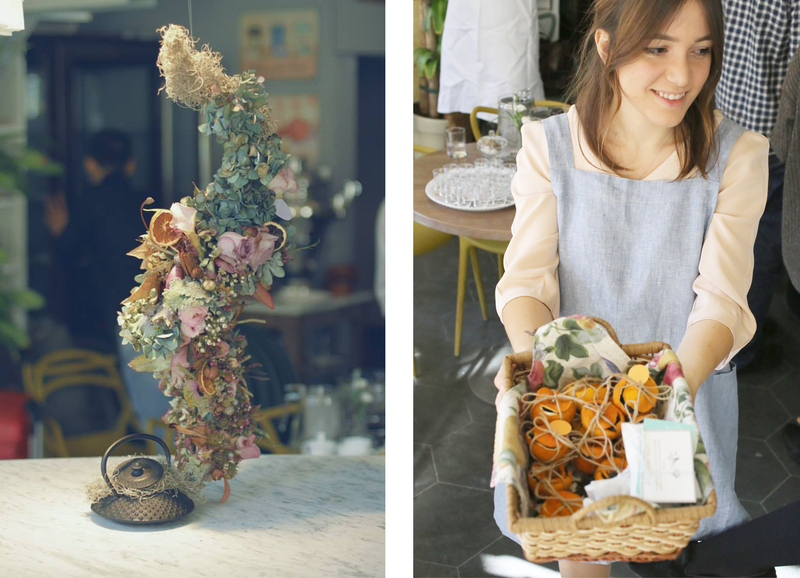 left photo courtesy of Düğme Film / Ece wears a Sobremesa apron in the picture above. The beautiful table center piece arrangement by Vesaire. It was truly beautiful, I couldn’t take my eyes off of it for a long time. 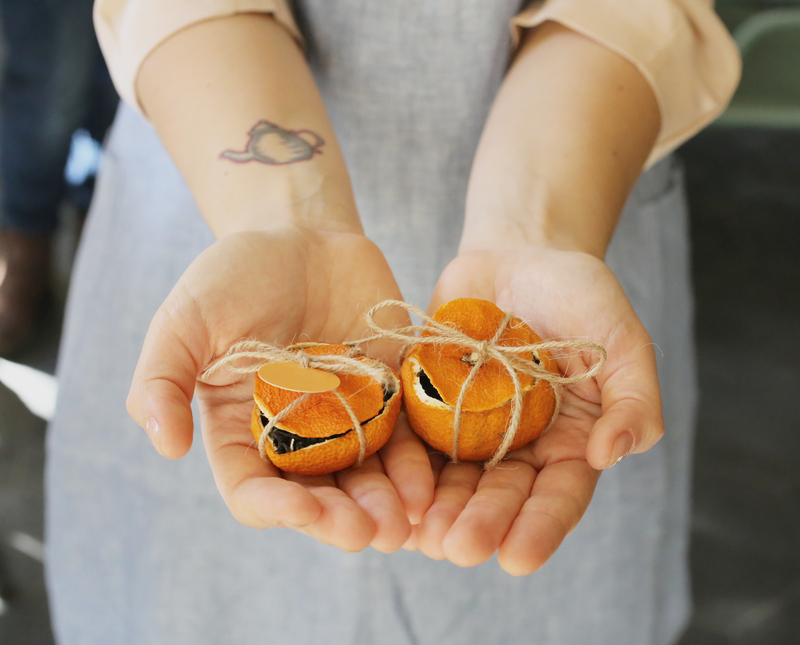 // Ece prepared for us these to-die-for blends, filled in mandarins. I was really amazed by it, very creative! The gifts left a huge smile on my face; a beautiful glass teapot, lavender sugar by Geraldine Cooks, ‘Blabbering Tea’ blend and flowering tea by Ece, Echinacea DIY kit by Müz, and a beautiful cotton bag by Sobremesa. Special thanks to all of them, they did an amazing job! I would like to share Ece’s Masala Chai recipe, it is one of my favorite teas so this is much needed! Heat 350 ml of filtered/spring water on a stove. Add cinnamon stick and a little piece of grated ginger, bring it to boil. In another pot, heat 100 ml of milk (of your choice) and add a little bit of saffron, honey or other sweetener. After the spice water is boiled, take it out from the heat and add 2 teaspoons of loose black tea, 10 crushed cardamom and 4 black pepper. Simmer it for 5 minutes and drain the spices. Mix it with milk. P.S. : You can add a little bit of fennel seeds as well. photo courtesy of Düğme Film. It was truly a beautiful event, made by beautiful people. I am really thankful to get to know everyone a bit closer. Special thanks goes to Ece, she is one special and talented lady. I find myself obsessing about tea and chasing different teas/flushes thanks to her. Hope to see you soon at the next event!